Rock garden design plan categories include Japanese-style rock gardens, gardens for sunny and dry areas, and spring-blooming rock gardens, to name a few. Rock gardens use the natural terrain and stones to create a pleasing landscape design. They're great for problematic areas, especially areas that are too hot, dry or sunny. Many rock garden plans prosper in forbidding terrain. Alpine plants, for example, are used in rock gardens because their natural mountain habitat in Europe is a rocky land of extreme elevation and temperature. Other rock garden plants come from desert areas and mountainous regions throughout the world. Japanese rock gardens merit special mention. Over the centuries, master Japanese gardeners have developed serene garden designs emphasizing balance, proportion, and flow. These gardens incorporate plants, rocks, sand and simple forms to create serene and relaxing gardens. The following websites offer rock garden design plans suitable for the home gardener. Read through the plan carefully to make sure you have the right garden conditions. Then, see if you need to adjust the plan. You may have less space, for example, than the plan calls for, which will necessitate a few changes to make the design fit in your garden space. Better Homes and Gardens offers three free rock garden designs on their website. 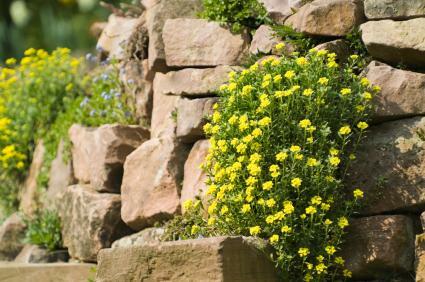 Choose from among the long-blooming rock garden, which promises several seasons of color; the spring blooming plan; or the summer blooming rock garden plan. Each plan includes the approximate area needed for the garden, as well as a list of plants and materials and a color drawing to guide you. You can download any of the three plans free of charge from their website. Garden Couch offers a rock garden plan for beginner gardeners. It's also a nice plan for people with small backyards, because it fits into a section about three feet by two feet and gives you a lot of impact for a small amount of space. Gardening Know How offers step-by-step instructions on designing your own unique rock garden. Instead of giving you a specific design plan, the site walks you through the essentials so you can create your very own plan. If you love the look of a rock garden but your garden isn't big enough to accommodate one or you live in an apartment, how about an indoor rock garden? Using an old-fashioned terrarium method of gardening, you can create a miniature garden. Simply take an old fish tank, fill it a third of the way with soil, then use miniature alpine plants and rocks to create a tiny rock garden. A desert-style rock garden can be created using cactus, succulent, and special cactus soil. Rock gardens are beautiful and mimic the natural landscape. Whether you choose the look of an alpine garden with flowers cascading over rocks like waterfalls or the serenity of a Japanese rock garden, there's a style that fits your taste, home architecture, and budget.